Now we are expecting a wealth of protests when you read this next sentence but we don't care as we know it is a fact. Even the most conscientious of workers spend a portion of their day 'pretending to look busy'. As soon as the boss catches your eye or somebody wanders past who is in authority the head goes down and you either start scribbling or typing like mad as if you say “look at me go, I've never stopped today”. If you work in a call are on the phone and the computer at the same time you can pretend to be correcting notes or placing orders or all manner of things to make sure those who must be obeyed think you are doing just that. These brilliant Someone’s Watching corporate ecards sum up this practice perfectly with its pale blue background and the silhouette of a worker sitting before their computer. 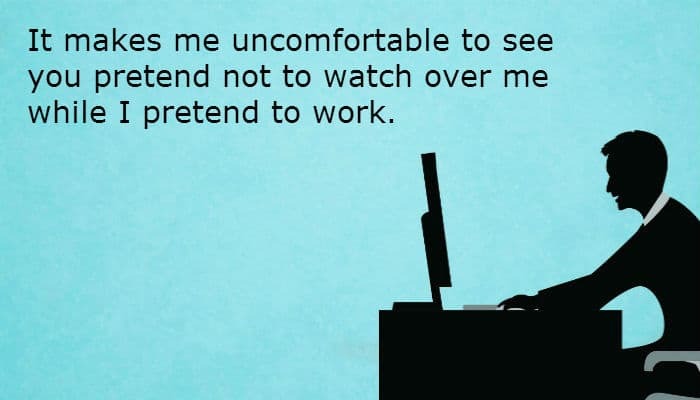 The text reads “IT male me uncomfortable when you pretend not to watch me when I pretend to work”. You can add your own text on the front as well such as 'memo to supervisor' for example then send it around your workmates and try to catch their eye when they open it and try not to laugh out loud. We would love you to hop over to check out our Christmas ecards for business when you get a moment and see how we can jazz up your Christmas business marketing.